This course is ideal for moms and dads who have little time, but are in need of practical tips about how to respond in an emergency with a baby or child. With our first aid advice for parents and caretakers, we cover a whole range of different conditions and techniques. 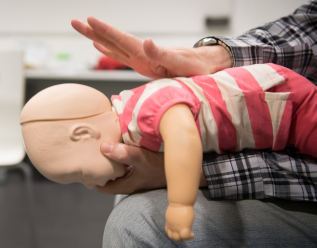 From knowing how to put a child or infant in the recovery position if they are unresponsive but breathing, to dealing with a choking child or baby. It’s an interactive course where you can drop your own concerns, so you will go home with the answers you need. Our trainers will help you learn some key skills that are important to know. At this short course there will not be an exam, but you will receive a certificate of participation and the Guardian Angel's handbook, so you can read all the information given afterwards as well. insect stings, bloody nose, object in nose/ear etc.